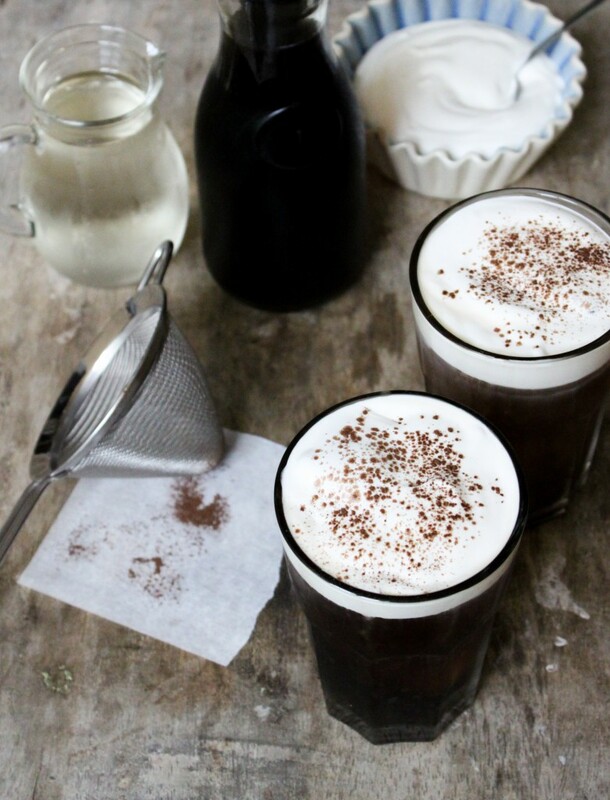 This sea salt coffee drink features cold brew coffee topped with a luscious sea salt cream. I had the opportunity to visit Taiwan back in 2007. After I completed my study abroad courses in Tokyo, one of my really good friends invited to show me around Taiwan. I loved Taiwan and I would definitely go back. It reminded me of the Philippines: the same smells, same heat and humidity, same friendliness and hospitality of its people. My friend and I traveled up and down the country where we did a lot of shopping and sightseeing, but primarily a whole lot of eating. I probably gained at least 5 pounds during that week long stay. I really enjoyed the night markets. I even liked the fried stinky tofu! And like everyone says, it’s easy to find the vendors selling it, all you have to do it close your eyes and follow your nose. For part of the trip, my friend’s relatives graciously let us stay at their house. They lived within walking distance of an 85 Degrees location. That was my first introduction to 85 Degrees. I was immediately hooked. I was in love with all their baked goods and delicate cakes. 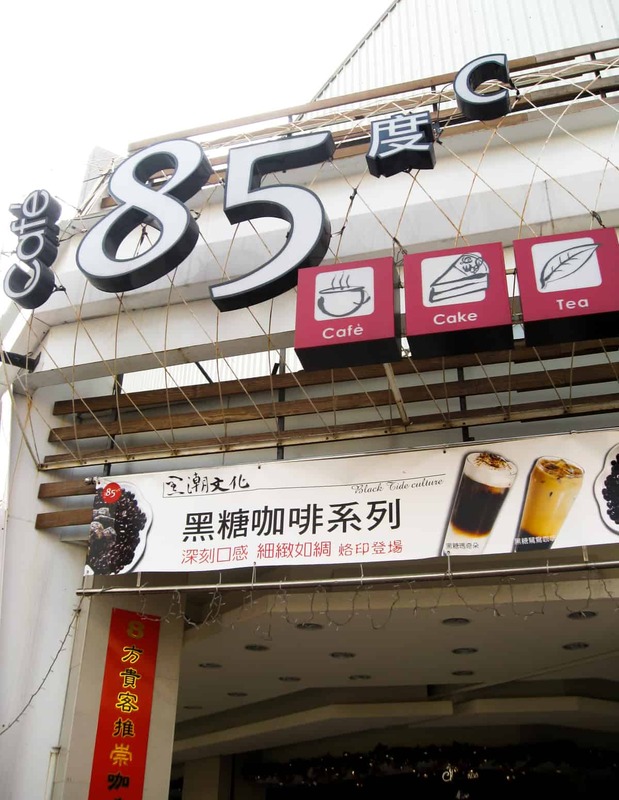 Since then, 85 Degrees has opened a handful of locations outside of Taiwan. Luckily, there are three outposts in Southern California. The first location popped up in Irvine and it was (and still is) a big hit. I would drive the 40 plus miles from LA at least twice a month. I would endure the crazy long lines for their freshly baked breads. As of recently, they’ve opened two other locations in Rowland Heights and West Covina. Good thing that my parents’ live in close proximity to both stores. Now, I can have my bread and coffee fix every time I visit the folks. To be honest, I didn’t like sea salt coffee the first time I ordered it. I only got it because I was told it was their most popular drink. The amount of cream they ladled into the cup scared me; I didn’t want to mix it into the rest of the coffee. Needless to say, it wasn’t very good without the cream. I eventually ordered it again. This time, I shook the coffee and salted cream together and BAM! My eyes lit up and my taste buds did a little dance. Sure, it may sound strange and weird to add salt to your coffee, but its actually is a terrific match. The added salt diminishes the bitter flavors and highlight the rest of the coffee notes. Try adding a pinch of salt next time you drink black coffee. You’ll notice a difference. I’m a big fan of salt in general. Salt makes every taste better. It makes beef taste beefier, butter taste butterier, its one of the building blocks of flavor. I’m picky when it comes to iced coffee. I can’t stand it when the ice cubes melt and dilute my drink. To prevent such happenings, I have learned make frozen coffee cubes ahead of time. When making iced coffee, I prefer to cold brew. I use a 3.5 liter Cambro food container. Pour in 3 quarts of cold filtered water. I warm up the coffee beans in the microwave for a couple of seconds before I roughly grind them. Warming the beans helps to release the oils and flavors of the coffee bean. Pour the grounds into the water and stir until the grounds are soaked and distributed. Cover with a lid and let sit at room temperature for at least 8 hours. I like to let mine sit for a full 24 hours. Once the coffee is ready, strain out the coffee grounds. I start with a mesh strainer to get rid of the big chunks, then I proceed using coffee filters to clean the rest of the coffee. Store coffee in the fridge until ready to use. 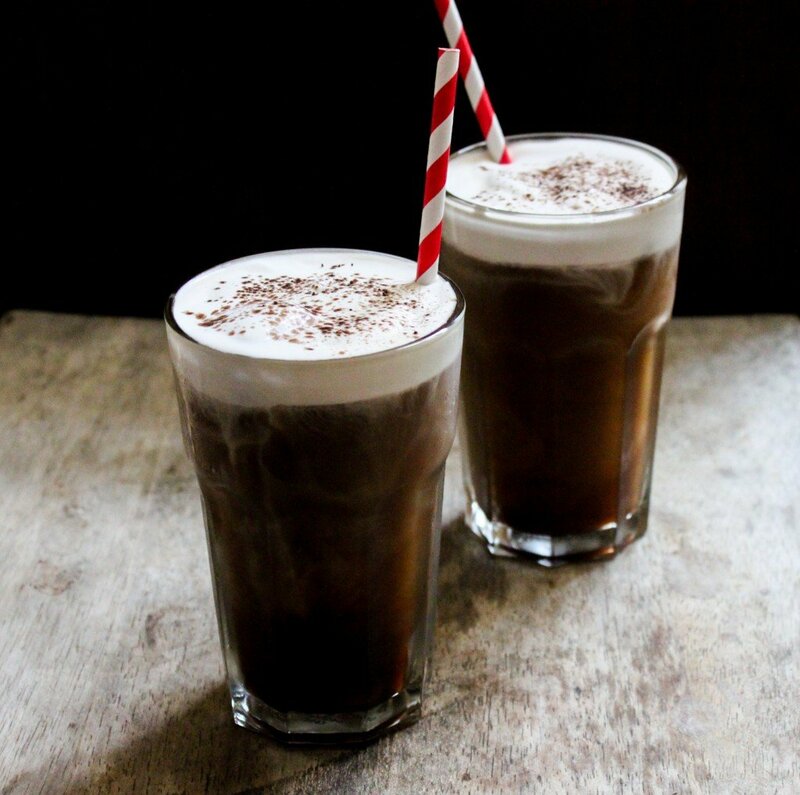 Simple syrups wins over regular granulated sugar; With simple syrup you don’t have to wait for the sugar to dissolve into the drink. Simple syrup can be easily made by boiling a one to one ratio of water and sugar. Cool it down and store it in the fridge for a long time. If you want to get really fancy, you can make a simple syrup using turbinado sugar ( Intelligentsia does that). Whipping the cream can be done by hand using a whisk. Pour the cream and salt in a medium size bowl and start whisking. Whisk just before soft peaks once the cream has slightly thickened and increased in volume. One thing I’ll never forget from my first kitchen job–cream whips best when cold. Once you have all your components ready, start assembling! 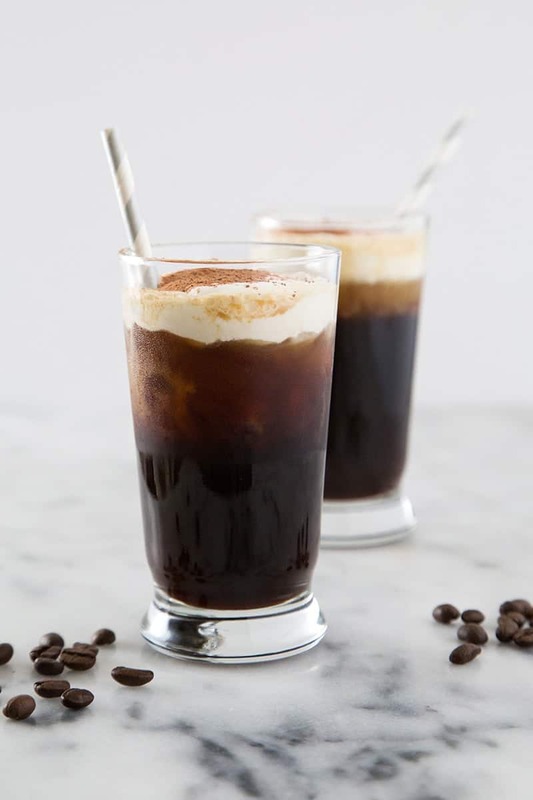 Place frozen coffee cubes in the glass, followed by the cold coffee and simple syrup. Stir it around and make sure the sweetness is to your liking. For the last step (and best part), scoop enough whipped sea salt cream to cover the coffee. Dust with a little cocoa powder to make it look pretty and stir it up. 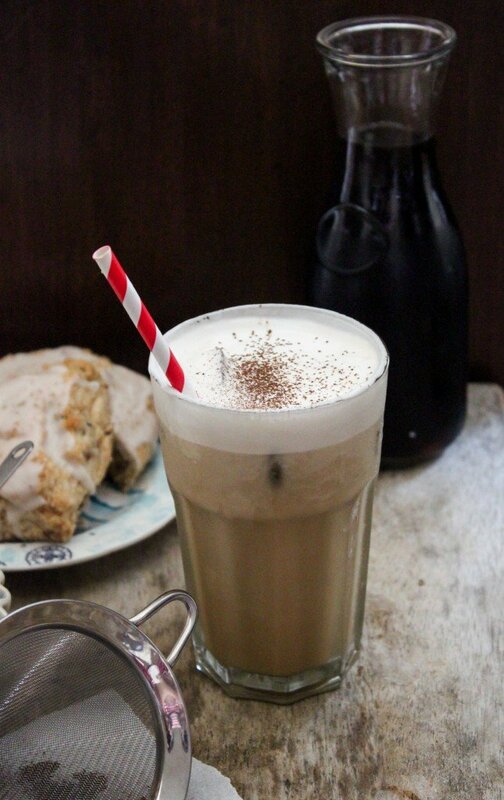 And of course, enjoy your homemade sea salt coffee! Find a large container with a lid, such a 3.5 liter Cambro food container. Pour in 3 quarts of cold distilled water. Cover with lid and let sit at room temperature for 24 hours. Strain out the coffee grounds. Start with a mesh strainer to get rid of larger pieces. Then, proceed using coffee filters set over the strainer to clean the rest of the coffee. Store coffee in fridge until ready to use. 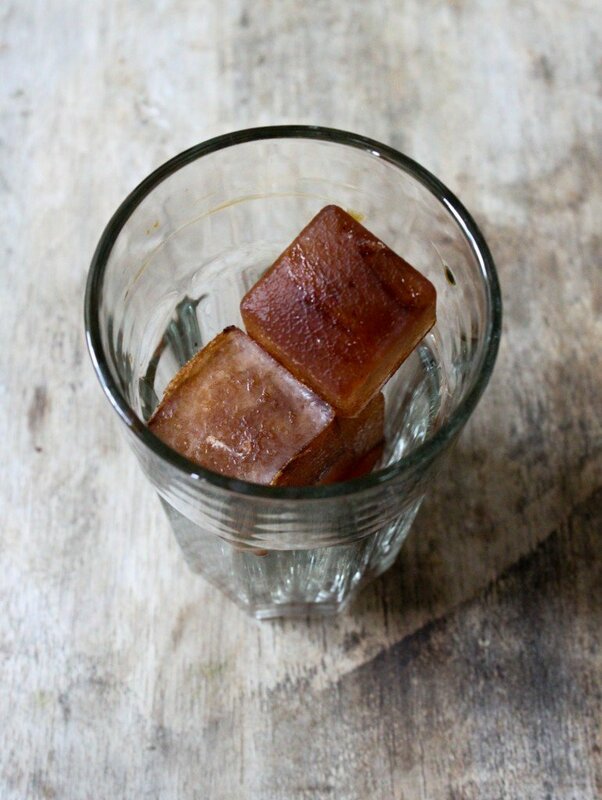 If you’d like, make frozen coffee cubes in ice cube tray. Combine water and sugar in a medium saucepot. Bring to boil until sugar has fully dissolved. 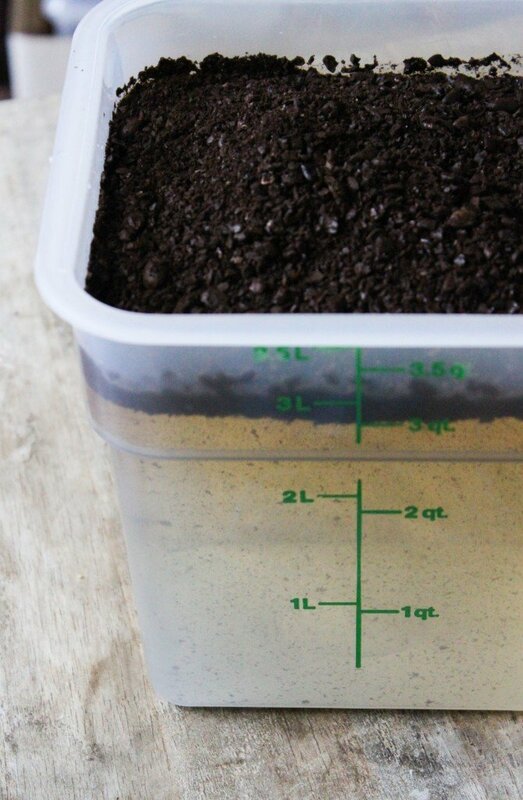 Let cool and transfer to a container with a lid. Chill in fridge until ready to use. Whisk together cold cream and salt in a medium bowl. Whisk until soft peaks, just until cream has thickened and increased in volume. Keep cold and covered until ready to use. This sounds great. My boyfriend first got me salting my coffee when I was working as a barista. Woow this looks amazing! I love 85C and always order their sea salt green tea. Thanks for sharing this recipe! Thanks! I haven’t tried the sea salt green tea yet. So far I’m in love with sea salt coffee and the taro smoothie. This looks amazing! I can’t wait to try the Sea Salt Cream in our hot coffee tomorrow! Thanks, Anne! I hope you enjoy it! HI! Sigh, I miss the Philippines. Looking forward to reading about your adventures! Your blog is fabulous. It has a very clean look. Do you have any idea how many calories are in the large 85 Degree sea salt coffee? Also, the small? Hi Lisa! Unfortunately, I don’t know. I’m not sure if they list their nutritional info at the store. Omg! It’s an old Navy tradition to put a pinch of salt on the coffee grounds before brewing, I didn’t know it had become cool! Oh! I’d love to hear about other Navy food traditions. I’m sure there are plenty! Hi Mike, honestly I don’t know the shelve life of the coffee. It lasted less an week in my house (and that’s only between two coffee drinkers). If you want to make it laster for a long time, freeze it into ice cubes and melt as you need. Thanks for the recipe! Did you use sweetened cream or was it just average-unsweetened heavy cream? Thanks again! ahhhh had to head on over here after reading your comment! Haha, I kind of love it but don’t like the fact that it looks as if I copied someone. xP I’m sure you understand my feelings??! Hehe, it just means we are that much in sync with each other. Yours sounds even better since it’s cold brew coffee…..I haven’t cold brewed yet but it’s def. the best option for the iced variety. Oh yeah! And your cubes remind me of coffee code in Fullerton (OC). My friend brought me some last week and I fell in love. Finally someone(s) who understands that most of us hate diluted coffee. ^_^ Have a blessed day, lovely M!